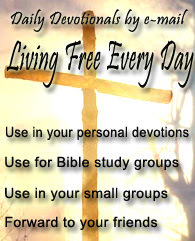 Living Free Every Day® daily devotions are e-mailed daily (Monday through Friday) to subscribers. The devotions are based on life-changing biblical principles taught in Living Free Small Group Curriculum. They address life-controlling problems that may be affecting you or someone you care about. We invite you to use these in your personal quiet times and also to share them with friends, Sunday school classes, Bible study groups, or wherever you feel the message will minister. Sign up now. Yet another great resource; enJOY!